Since the majority of deaths in the United States occur in adults over the age 65, practitioners who care for geriatric patients play a key role in ensuring that submitted data reflect mortality in the United States as accurately as possible.10 It should therefore be a priority of current practice for providers to be educated in the tenets of death certificate completion. Having come to understand the importance of these data and the problem with accurate collection, the authors undertook to discern whether this challenge existed at our own institution, a major academic medical center in New England. Prior to the initiation of this project, our medical center had established a committee to review adult inpatient deaths for the purpose of quality improvement in medical management. Cases included adult general medical floor deaths as well as adult ICU deaths and were randomly assigned to attending, resident, and physician assistant reviewers on a monthly basis. The cache of 50 adult deaths assigned between May 2014 and October 2015 to one resident reviewer involved in this study provided the source cases for data collection. Each case underwent thorough chart review, and specific data were extracted. Data collected from the chart focused on patient and provider characteristics that were hypothesized to impact accuracy, such as patient length of stay, provider level of training, provider familiarity with patient, code status, etc (see Table 1). The number of underlying illnesses and complexity of medical presentation were recorded for reviewer information but not formally analyzed due to variations in medical record maintenance. Data collected from the death certificates were limited to CoD, contributory diagnoses, and manner of death. Researchers did not analyze duration of each contributing problem, tobacco use, or patient pregnancy status. In the course of data collection and chart reviews, the accuracy reviewers underwent additional training in death certificate completion via online and literature-based self-teaching as well as off-site training with local medical examiners. Following training, reviewers established their own cause-of-death statements for each case. The original cause-of-death statement as well as the alternate were then analyzed and assessed for accuracy. Of note, the majority of original certificate errors were evident from a technical standpoint without requiring a full medical record review. Completely accurate certificates as well as points of inaccuracy were then identified and tabulated. In analyzing the data, it became evident that the same issues with accurate completion existed at our institution as were evident at the national and international levels. Most notably, some type of error (major or minor) was present in 46 of 50 (92%) of cases. The vast majority of these—78%—were "technical" errors alone, such as incomplete information, too much information per line, or a nonsensical progression through the underlying causes of death. A small number (7 of 50) also included what we classified as "medical" errors, where the reviewers disagreed with the medical thought process behind the cause-of-death statements. Each of these seven cases also included "technical" errors (see Table 2). Given the high error rate overall, there were very few trends identified (see Table 3). No patient characteristics were significantly associated with level of accuracy. Level of medical training—thought to be a likely association with accuracy—was also not statistically significant overall. However, level of training was significant when it came to "medical" errors. No attending-level providers were assigned "medical" errors on their certificates. In addition, cardiac or respiratory arrest were incorrectly entered as immediate CoD on 11 of 50 certificates, none of which was completed by attending-level providers. While no patient characteristics were predictive of error rate, it is notable that 84% of our adult medicine population deaths occurred in patients older than 65, evenly divided between those aged 65 to 84 and those aged 85 or older. A wealth of literature is available highlighting the prevalence of death certificate inaccuracy seen at the national and international levels, as well as multiple studies that indicate lack of training as the root cause in the United States. Despite these noted errors, death certificate data continue to inform research pathways and drive medical practice. 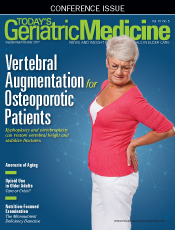 The study described above further highlights significant room for improvements and a potential role of geriatricians in bringing this about. • Provide an annual hour-long didactic session to refresh learners at all levels on the basic tenets of death certification and expose those who have never undergone training to proper methods for accuracy and clarity. • Elevate the completion of the death certificate to a team-based learning opportunity by encouraging teams to complete them together. The certificate thereby has greater potential for accuracy, and the team has the best opportunity for processing, reflection, and retention. • Manner of Death: Natural, accident, homicide, suicide, undetermined. Most providers will complete death certificates for natural deaths only. Medical examiners should be called for all others, including deaths related to hip fracture, as they tend to qualify as accidents, and deaths related to a history of malicious injury, as those may be homicide. • Timeline: Located to the side of the CoD statements. It clarifies duration of disease presence to time of death and may be used to inform research questions pertaining to patterns of disease progression. • Contributing Factors (ie, comorbidities or other significant conditions): This portion can have multiple entries and should include any significant diagnoses that do not directly contribute to the CoD narrative. • "Probable" and "Presumed" are acceptable when diagnosis is unclear. • CoD should include only one entry per line and not all lines need be used depending on available information (see above). • "Cardiac arrest," "respiratory arrest," and "old age" are not acceptable entries under causes of death. The authors acknowledge that the above guidelines are not exhaustive, and the challenges faced in completing death certificates accurately will continue to be fraught with best medical estimates as opposed to decisive facts. As a result, we can rarely be 100% confident as to what caused a death and, therefore, must accept that our data cannot be 100% accurate. What they can be, however, are thoughtful, informed, and collaborative. The majority of providers who care for geriatric patients will be called upon to complete death certificates. However, few among us will take the time to consider where the data go and why they matter. By glossing over this process, we are missing the opportunity to learn from our patients in death as we did in their lives, to improve the medical care and familial support that we provide as individuals and as institutions, and to impact the direction of health care on the national scale. — Emily Carter, MD, is a recent graduate of the Baylor College of Medicine Geriatrics Fellowship. She is a board-certified family physician and will return to Maine Medical Center as an attending physician this fall. — Christina Holt, MD, MSc, is research director for family medicine and director of the Preventive Medicine Residency Program at Maine Medical Center. Prior to returning to academics, she was a medical examiner in a practice in rural Maine and has done research using both birth and death certificate data for comprehensive community care. — Amy Haskins, PhD, is the research navigator for the Maine Medical Center Department of Family Medicine. Her background in epidemiology and research design helps all members of the department design and complete research, quality improvement, and evaluation projects. 1. Pritt BS, Hardin NJ, Richmond JA, Shapiro SL. Death certification errors at an academic institution. Arch Pathol Lab Med. 2005;129(11):1476-1479. 2. Aung E, Rao C, Walker S. Teaching cause-of-death certification: lessons from international experience. Postgrad Med J. 2010;86(1013):143-152. 3. Azim A, Singh P, Bhatia P, et al. Impact of an educational intervention on errors in death certification: an observational study from the intensive care unit of a tertiary care teaching hospital. J Anaesthesiol Clin Pharmacol. 2014;30(1):78-81. 4. Ong P, Gambatese M, Begier E, Zimmerman R, Soto A, Madsen A. Effect of cause-of-death training on agreement between hospital discharge diagnoses and cause of death reported, inpatient hospital deaths, New York City, 2008-2010. Prev Chronic Dis. 2015;12:140299. 5. Wexelman BA, Eden E, Rose KM. Survey of New York City resident physicians on cause-of-death reporting, 2010. Prev Chronic Dis. 2013;10:E76. 6. Williams L, Dewey H, Kapp MB. Long-term complication: Florida's death certification process and long-term care. Int J Risk Saf Med. 2011;23(3):139-147. 7. Maharjan L, Shah A, Shrestha KB, Shrestha G. Errors in cause-of-death statement on death certificates in intensive care unit of Kathmandu, Nepal. BMC Health Serv Res. 2015;15:507. 8. Myers KA, Farquhar DR. Improving the accuracy of death certification. CMAJ. 1998;158(10):1317-1323. 9. Smith Sehdev AE, Hutchins GM. Problems with proper completion and accuracy of the cause-of-death statement. Arch Intern Med. 2001;161(2):277-284. 10. Kochanek KD, Murphy SL, Xu JQ, Tejada-Vera B; Centers for Disease Control and Prevention, National Center for Health Statistics. Deaths: final data for 2014. https://www.cdc.gov/nchs/data/nvsr/nvsr65/nvsr65_04.pdf. Updated April 3, 2017. 11. Brooks EG, Reed KD. Principles and pitfalls: a guide to death certification. Clin Med Res. 2015;13(2):74-82. 12. Thornton RG. Death certificates. Proc (Bayl Univ Med Cent). 2006;19(3):285-286. 13. Mortality data. Centers for Disease Control and Prevention, National Center for Health Statistics website. https://www.cdc.gov/nchs/nvss/deaths.htm. Updated August 8, 2017. 14. Binsaeed AA, Al-Saadi MM, Aljerian KA, et al. 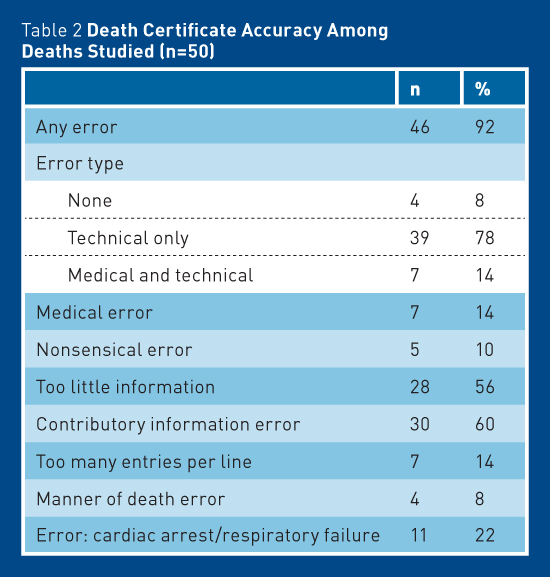 Assessment of the accuracy of death certification at two referral hospitals. J Family Community Med. 2008;15(1):43-50. 15. Hernández B, Ramírez-Villalobos D, Romero M, Gómez S, Atkinson C, Lozano R. Assessing quality of medical death certification: concordance between gold standard diagnosis and underlying cause of death in selected Mexican hospitals. Popul Health Metr. 2011;9:38. 16. Nielsen GP, Björnsson J, Jonasson JG. The accuracy of death certificates. Implications for health statistics. Virchows Arch A Pathol Anat Histopathol. 1991;419(2):143-146. 17. Degani AT, Patel RM, Smith BE, Grimsley E. The effect of student training on accuracy of completion of death certificates. Med Educ Online. 2009;14:17. 18. Centers for Disease Control and Prevention, National Center for Health Statistics. Physician's handbook on medical certification of death. https://www.cdc.gov/nchs/data/misc/hb_cod.pdf. Published April 2003. 19. Centers for Disease Control and Prevention, National Center for Health Statistics. Instructions for completing the cause-of-death section of the death certificate. https://www.cdc.gov/nchs/data/dvs/blue_form.pdf. Published August 2004.